In last night’s blowout loss, the Timberwolves used a mix of coverages to disrupt the Spurs’ offense on Wednesday night. They trapped the ball handler at times, used hard double teams against the Spurs’ star players, and generally felt comfortable all night leaving someone open to zone up in the paint. While they did prevent the Spurs from getting to the rim as often as usual, the most important effect of their aggressive help defense was an increase in turnovers and ensuing fast breaks, a problem the Spurs have struggled with this season. It started early, as the Timberwolves attacked the Spurs’ pick and pop action. Karl-Anthony Towns’ aggressive help catches DeMar DeRozan completely off guard and his wayward attempt at unloading the ball ends up going the other way. It’s not a switch, though. Robert Covington is recovering to DeMar before the ball comes loose. Jeff Teague lingers in the paint as long as he can to deter a drive, and Taj Gibson takes his place, planting himself in the restricted area. Even if DeMar can get the ball back to LaMarcus Aldridge, the worst case scenario for the Wolves is probably a LaMarcus jumper, a shot they are more than willing to concede. Midway through the 1st quarter, similar help produced a similar result. The Spurs use an Iverson cut to get Bryn Forbes the ball on the wing, followed by DeMar setting a backscreen for Dante Cunningham before flashing to the top of the key. Bryn throws DeMar the ball and LaMarcus moves up to set a high screen. DeMar takes the screen going left, but Covington and Towns trap him way above the three point line. Covington’s length makes getting rid of the ball difficult, and DeMar jumps to throws a high-arching pass to LaMarcus. Towns started recovering the moment DeMar picked up his dribble, so LaMarcus only has an advantage for a brief moment before Gibson picks him up and Towns gets to Dante, who has cut along the baseline and clears out to the left corner. In the middle of that rotation, Bryn is open on the left wing and a pass that takes him slightly to his left and into his shooting motion would have resulted in as good a shot as the Spurs can hope to generate. LaMarcus is looking for Dante in the paint instead and takes a dribble to his right to try to create a passing angle. But with Gibson between the two, Towns hustling back into position and Andrew Wiggins helping down off Bryn, that’s not the right play. If he immediately swings the ball back to his left, while Wiggins is still moving towards the rim, Bryn gets an open look. He only has an instant to make the decision, though, because the Timberwolves did an excellent job of helping and recovering, a common theme throughout the game. With nothing accomplished and less than 10 seconds on the shot clock, the Spurs swing the ball back to DeMar on the left wing. He proceeds to attack Wiggins in isolation, with Covington helping all the way down to the corner of the lane and LaMarcus on the block on the same side. There’s just not enough room for DeMar to squeeze through, and Covington picks his pocket on the way by. And at the end of the quarter, they did it again. Towns shows above the three point line, even though DeMar is not a threat from that distance, and stays with him deep into the paint. For his part, DeMar needs to get LaMarcus the ball much sooner if that’s what he wants to do. Once he gets so deep, he likely needs to kick the ball out to Patty Mills in the corner. LaMarcus is in good position to seal Towns, so if Patty shoots he’s got good position for a rebound, or if Patty can get him the ball, he has a layup. The Timberwolves were also aggressive on post-ups, though not as successful. The Spurs use a Rudy Gay — LaMarcus side pick-and-roll to get LaMarcus in the post against Gibson. Once Rudy feeds him the ball, the Spurs’ shooters shuffle around the three-point line and the Wolves send a double-team baseline, helping off Derrick White in the corner. Derrick dives to the basket, and he’s open underneath, but with Towns 4 feet deep in the paint, LaMarcus has an easier pass to Rudy. This is not good defense by the Wolves. Teague can’t let Derrick get open under the rim like that, especially not if the alternative is DeMar at the three-point line. At the same time, Towns shouldn’t be this far off Rudy. He’s working to prevent LaMarcus from getting to the middle of the floor, but with a double coming, he has to be more ready to deflect the pass or close out to a good shooter. They didn’t quite get it right on their next two attempts, either. In the first clip, Wiggins zones up behind Towns as LaMarcus catches on the left side. LaMarcus kicks it out for a repost, so Wiggins clears to the other side of the paint. Once Dante cuts through to the dunker spot, Dario Saric picks up help responsibility as the low man on the weak side, but his timing is a little off. Still, he’s able to deter LaMarcus just enough to entice a pull up jumper that rims out. In the second, Towns doubles DeMar alongside Derrick Rose on the right block, so DeMar kicks it out to Patty at the top of the key. The Spurs swing the ball around the floor for a LaMarcus post-up, and the Wolves double him again. LaMarcus times his drive into the paint perfectly, negating Rose’s attempt to double, and putting Saric in a position where he has nothing but bad choices. If he stays with Dante, DeMar has an open lane to the rim, but if he helps off, Dante is open in the restricted area. He chooses the former, and DeMar takes it to the rack. The Wolves’ got progressively better at helping off the right players, and the Spurs got progressively worse at making them pay, leading to some definite low-lights and the 9-point 2nd quarter that effectively ended the game. 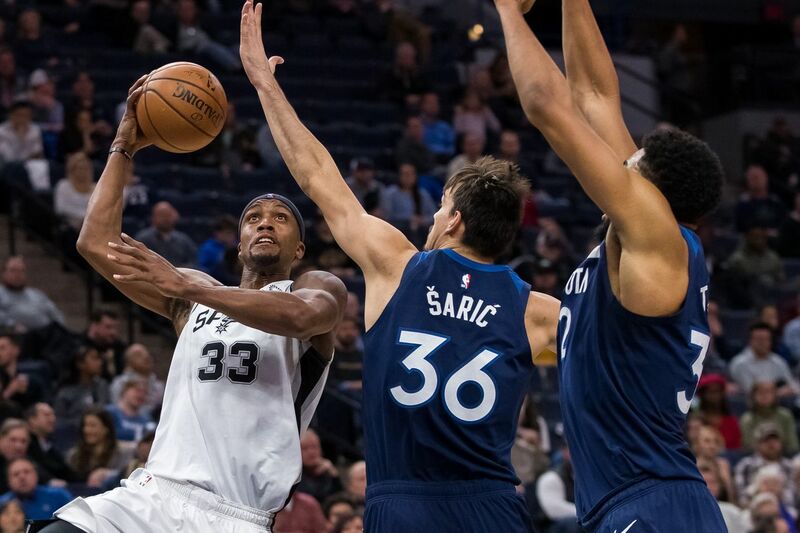 It would be easy to look at the scoreboard and think the Spurs’ defense got smoked, but 26 points off turnovers for the Timberwolves and their ability to capitalize on the Spurs’ mistakes put the team’s defense in a position it is particularly ill-suited to fill this season. To overcome that kind of head start, they would have needed to be dominant. Though they actually weren’t bad in the half-court, giving up 87.7 points per 100 plays, per Cleaning the Glass, they did give up 22 second-chance points off 13 offensive rebounds. Though tempting, I’m not going to show you all 13 times the Spurs failed to box out or lost a 50-50 opportunity, but suffice to say there was a distinct lack of effort on most of those plays. This team needs to win the turnover and rebounding battles every night, but they lost both in resounding fashion in this game and the T-Wolves deserve much of the credit for making that happen. Not every team has the speed, length, and coordination to execute like this, but if the Spurs can’t find a way to beat such a straight-forward game plan, they’re going to have a lot of rough nights.